Let's talk about the magic of autumn! Even if you dream of deleting every season except summer from your calendar (just as I do), you have to admit: There is a certain beauty about autumn. No matter how hard we cling to show a bare midriff and leave the house with naked legs, there comes a time when everything on a girl's mind is to snuggle into a cosy coat. While the leaves fall, the desire for something cosy grows and the need for a perfect autumn look awakes. 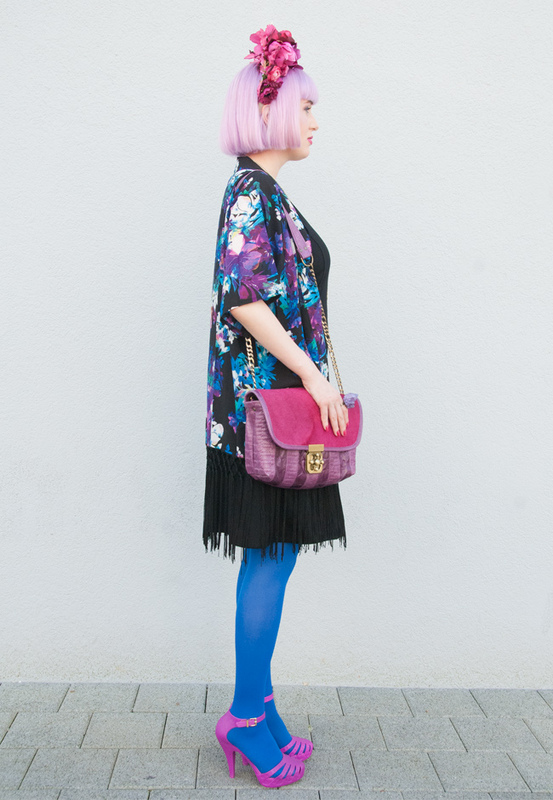 So when I was asked by La Redoute Switzerland to style a chic & stylish autumn look, I accepted the challenge. Some of you tell me that they wouldn't dare to wear most of my looks, so I tried to keep this look very wearable to inspire all of you. 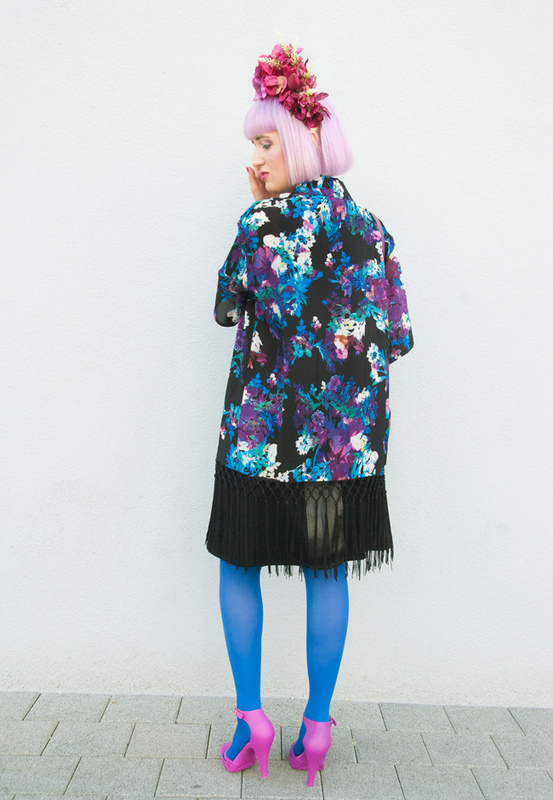 The key piece of my look is the coolest bubblegum coat ever. It's is a true investment piece and turns every outfit into an eye-catcher. If I could buy just one piece for autumn, it would be this wool coat. It is designed by Jacquemus, a rising star in the world of French fashion. I'll keep an eye on this label and think this is your chance to buy a true designer piece to a reasonable price. Since all fashion magazines declare that grey is the colour of the season, this lace skirt is a good choice to go with the dream coat. Nonetheless, I think the city needs some colour, and that's why I suggest adding berry shades, like this casual top. Everything else you need is a touch of glamour provided by the sequin clutch, and there is no way to avoid these pompom shoes. They don't only fit perfectly to the top, but they make girls awe. There you go – the cutest autumn look in the city is ready! All items of this look are available at La Redoute. Better hurry, it's already getting colder! 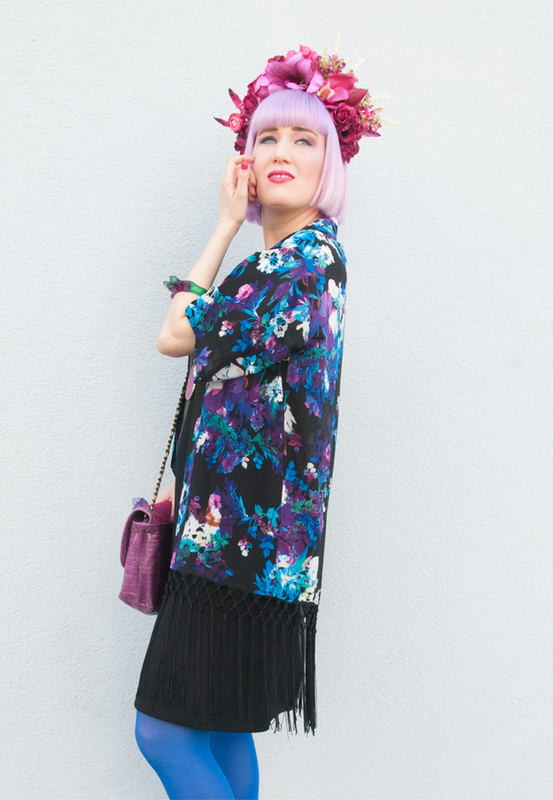 Greetings from a Geisha: Wearing a kimono and elaborate headwear. 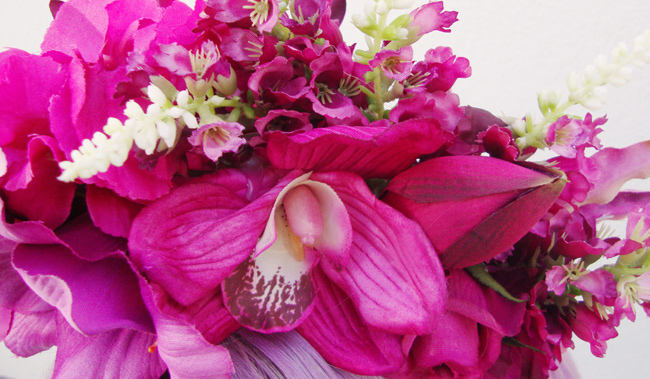 No need for a golden crown: Flowers beat everything, don't you agree? What a mix: Leather and delicate fabric, stone and resin, jelly and cowskin. 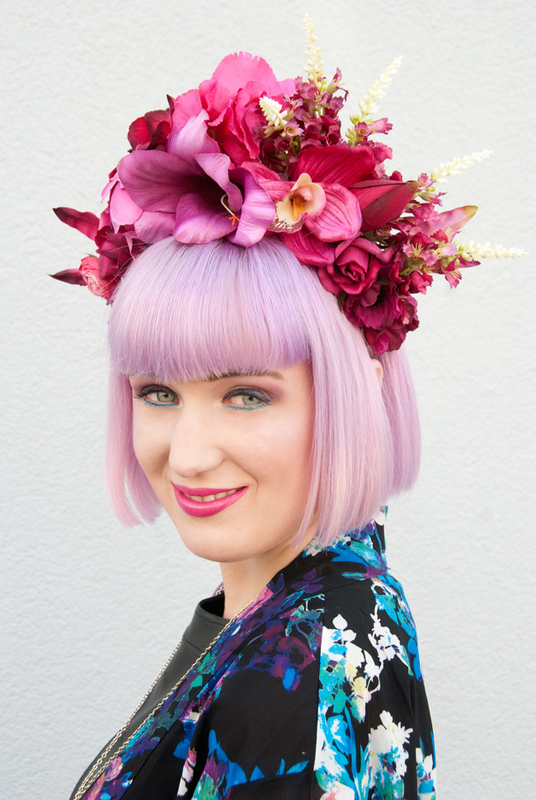 A bunch of vibrant flowers: don't put them in a vase, your head will do! 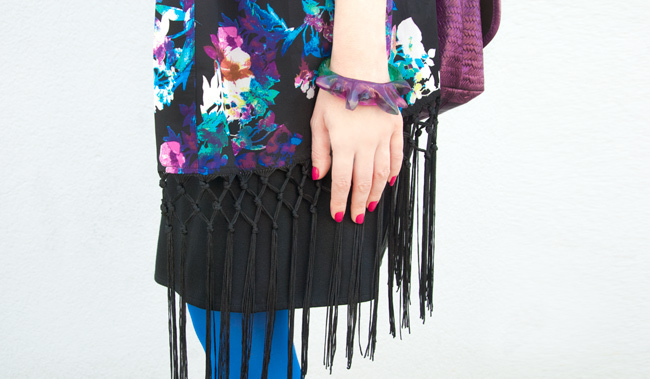 Mystical colours: Let's call the print of my kimono midnight garden! 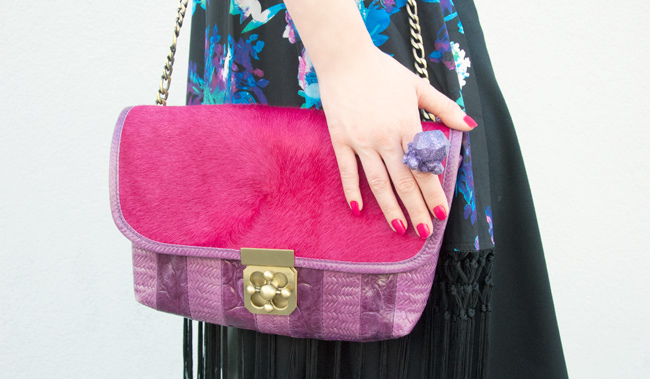 Every look can do a little bit of pink: All new accessories in my favourite colour. Sweet memories: The cowskin of my new bag reminds me of the old-fashioned school backpacks we used to have. Everlasting love: Never say no to a new pair of Melissas (especially not if they are on sale). Never be a wallflower: Just wear your crown with pride, wherever you go. Show me your back: The best looks are lovely no matter from what angle you look at them. Do you know that feeling when you put on a very special piece, and you just feel very beautiful immediately – closest to the feeling of being a goddess you ever get? While I don't consider myself as more than average looking, this is what happened when I dressed for this look. 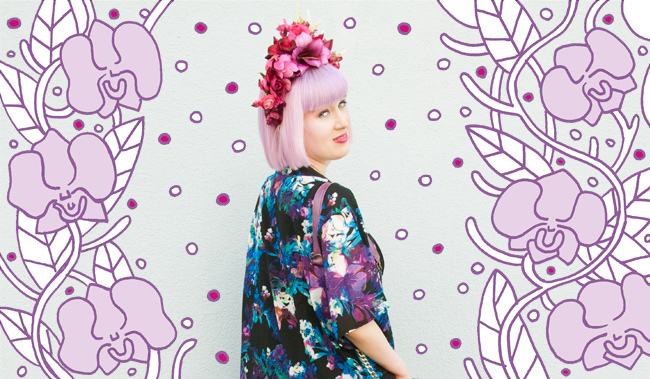 The headdress is magic made by the talented hands of my beloved Pearls & Swine, and I fell head over heels for this kimono from Quiz Clothing. I am playing with the tassels and love how they move in the wind. For once I am even wearing a black dress, do you see? 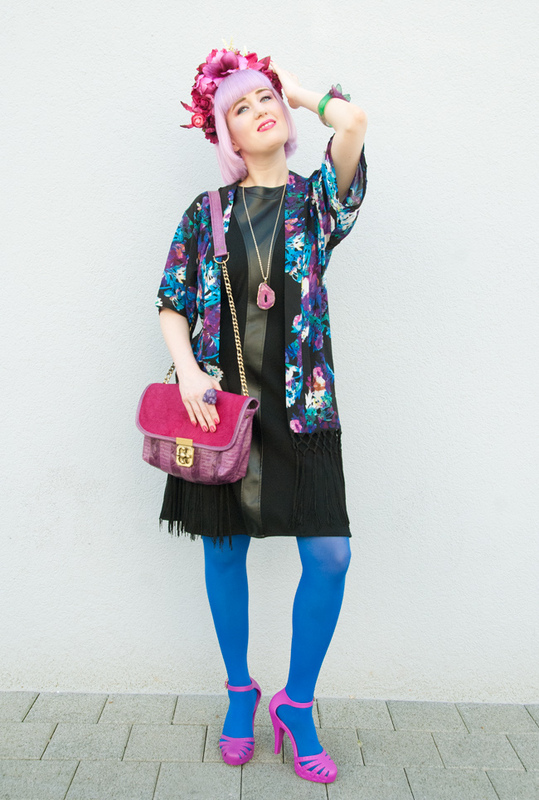 But it wouldn't be me if I wouldn't have mixed it with a lot of colours and quirky accessories. On days you don't feel good at all, it's a magical weapon to put on an outfit like this. It might change your day. 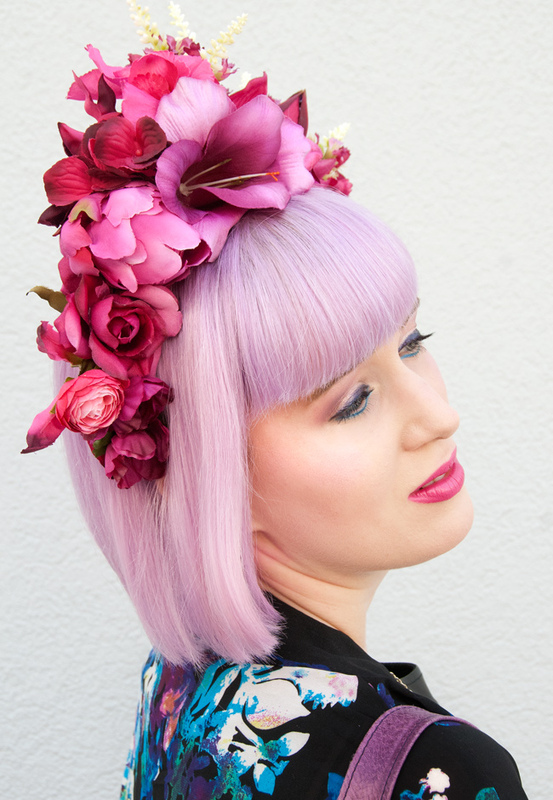 It also inspired me to the spontaneous act of dying my hair lilac. I love the colour; the only disadvantage is that it turns rather blue when it fades. Because of this I'm going to return to my beloved pink very soon, but for today's look the lilac was the final touch to add a mystical note to the look. Thanks to Quiz Clothing for the kimono. Friday, yay! For this week's Friday Favourites I chose very dreamy things, because I think that's what we need. 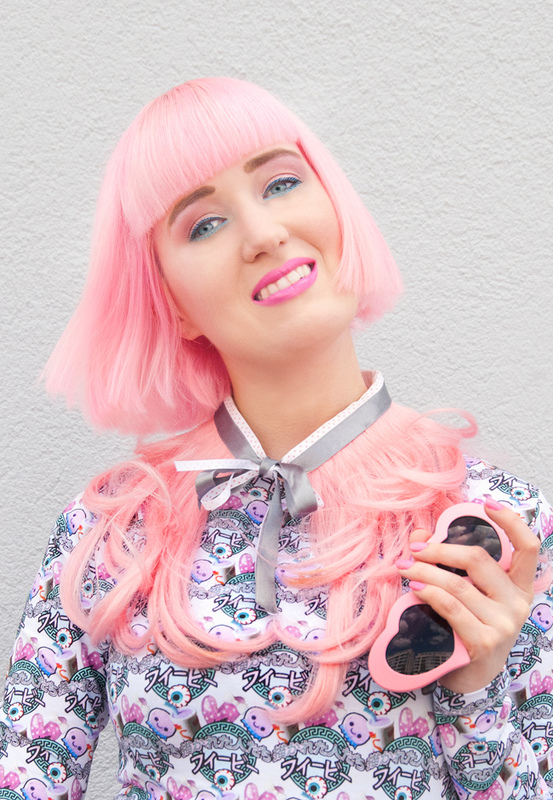 Dreaming of pink plastic hair, futuristic shoes, fluffy fur and a princess dress makes a girl forget about the hard work life, doesn't it? What are your plans for the weekend and how do you like my finds? 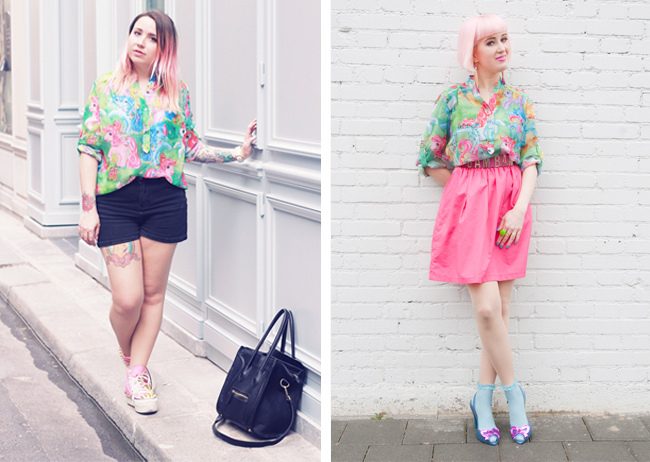 Oh my Flamingo: Tropical prints and my favourite animal for today's look. Beloved Pink Bird: Always wear a flamingo with pride and a smile on your mouth! 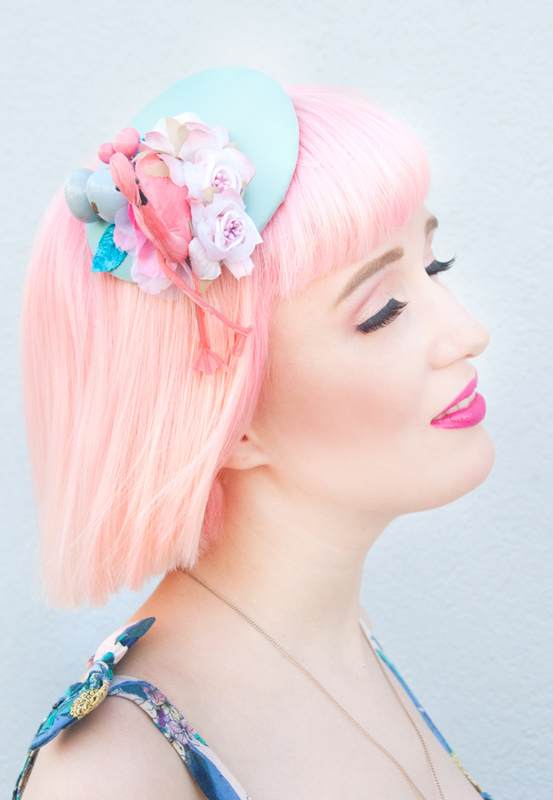 Mint and Pink: My favourite pastel combination at the moment. Cute Birdie: Isn't it darling how he stretches its legs? Crop Top Crush: There is still enough sun to show a bare midriff, yay! 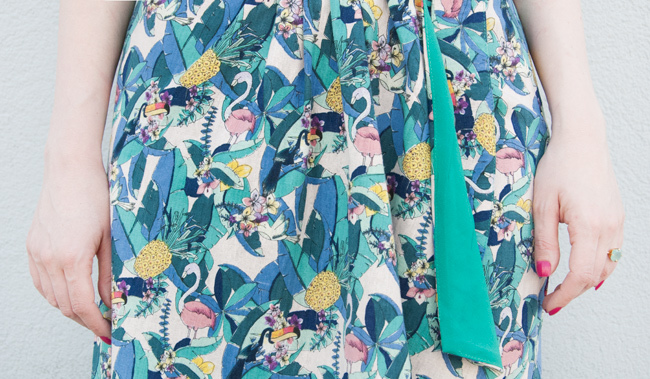 Let's get tropical: Toucans, pineapples and flamingos, what a perfect print! 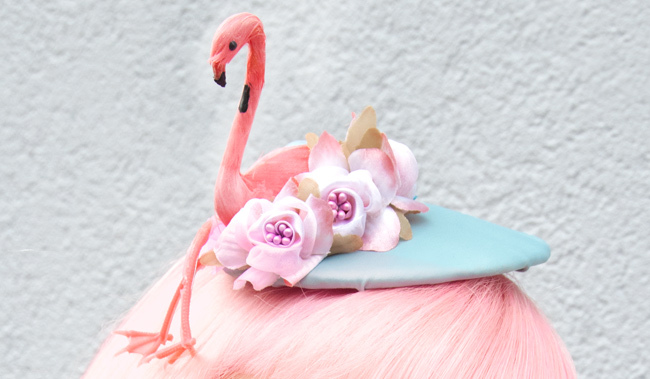 Pink Dreams: Loving every detail of this fascinator. It's just perfection! But finally the pictures are shot, the outfit looks as I imagined. Sometimes my outfit posts make me jump from my chair with joy because I think I created something I didn't manage before. More harmony, more edginess, a colour combination better than a rainbow… But usually it doesn't last long. It's a big hunger inside me; the demanding desire to create new looks. I wonder where it comes from: Why do I need more flamingos in my life, why can't I just be happy with ten skirts in my wardrobe instead of being the biggest supporter of pollution and carrying bag after bag of new stuff home? Why? Sending you a lot of flamingo love till then. I am very happy if you tell me how you like this look. Do you sometimes imagine how it would be to have a twin sister? According to Wikipedia, there are 9 to 16 twins per 1,000 births in Europe. My grand aunts were two of them and not only, but for a while even oldest twins alive at the age of 99. I am a twin too, just not by birth: I have several fashion twin sisters. We don't share our genes, but our style and a love for certain fashion pieces. While everybody of us is craving for uniqueness, it's also a pleasure to discover amazing girls all over the world having a similar taste in common. There is nothing better than sharing the excitement about the newest finds together. 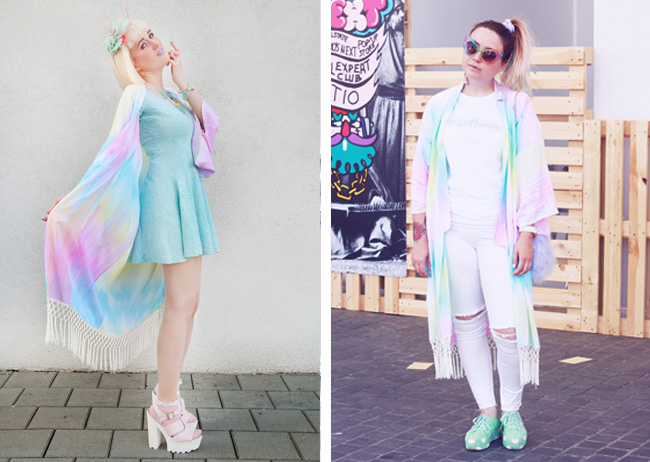 Here I present a few examples of bloggers I love, wearing the same as I do. I love to see how different one piece can be styled. All those girls inspire me and probably I do the same sometimes. 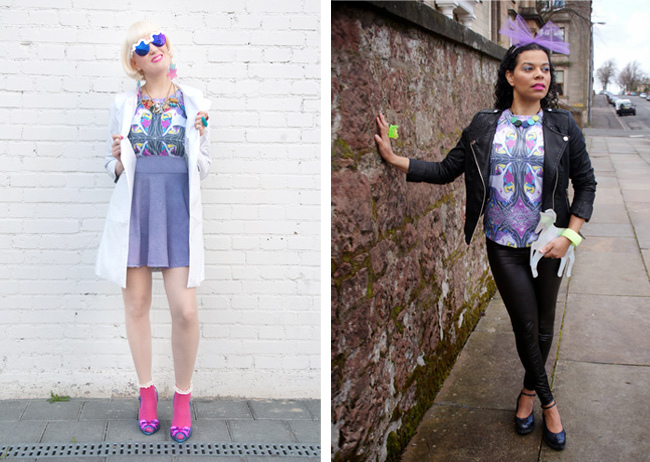 I love you; gorgeous fashion sisters and I am proud to share some pieces of my wardrobe with you! 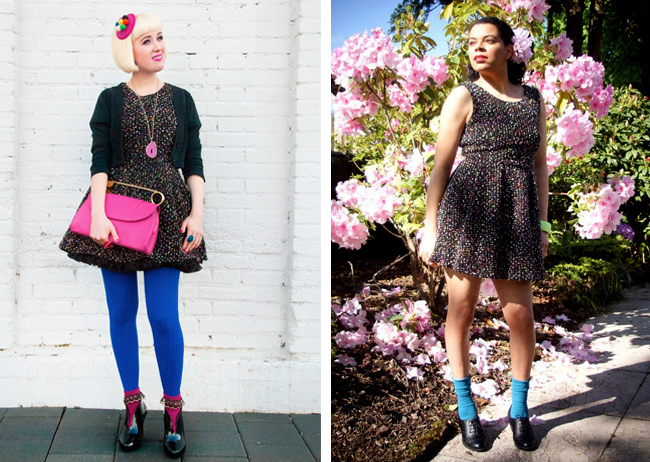 Do you have fashion twins too, lovelies and what do you think about these looks? Let the soap bubbles fly through the air. Hair and collar match: Perfect plan, isn't it? 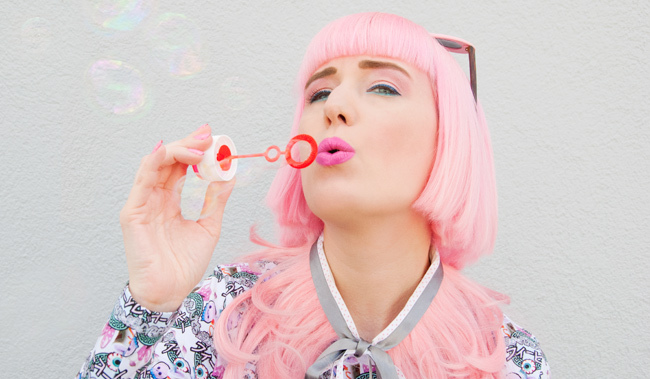 Bubblegum haired girls are happy to watch the rainbow coloured bubbles. No idea what is written there, I hope it's something as sweet as the pattern looks. 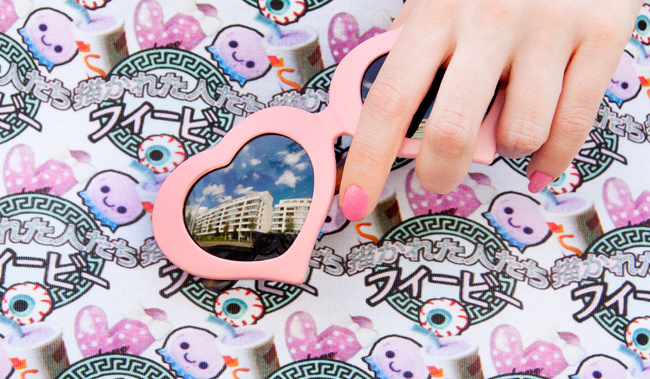 Feeling very kawaii today, almost like a Harajuku girl. I could laugh the whole day, wearing one of my fashion dreams around my neck. Lesson learned: Not all dreams are just cloud castles. Is it because of the heart shaped glasses or why do I feel so pink today? 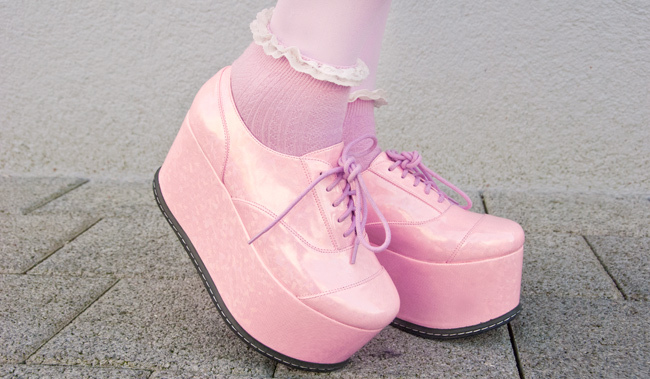 Long legs for tiny girls: Platforms, please! 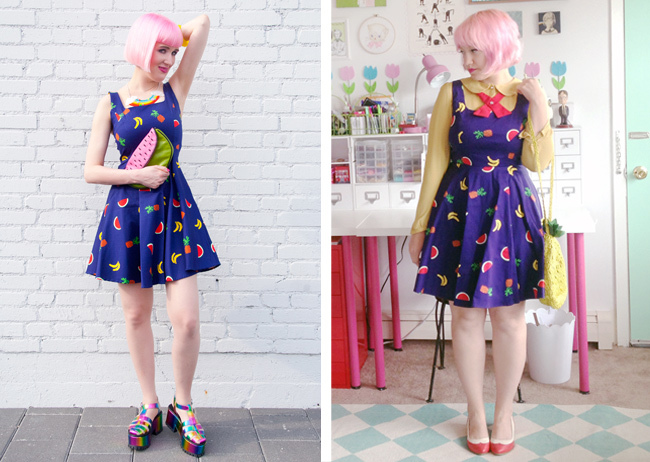 Cute, cuter, the cutest, my outfit! 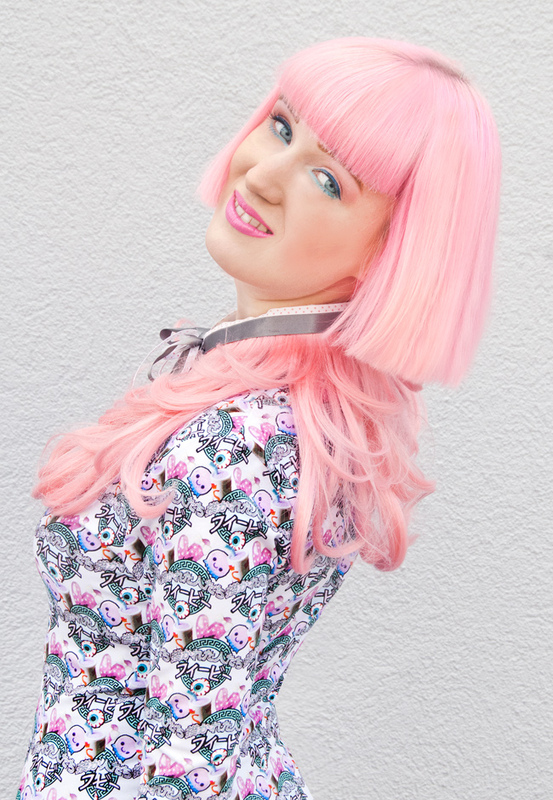 Oh yes, I try to fit as much Kawaii in my outfit as possible. 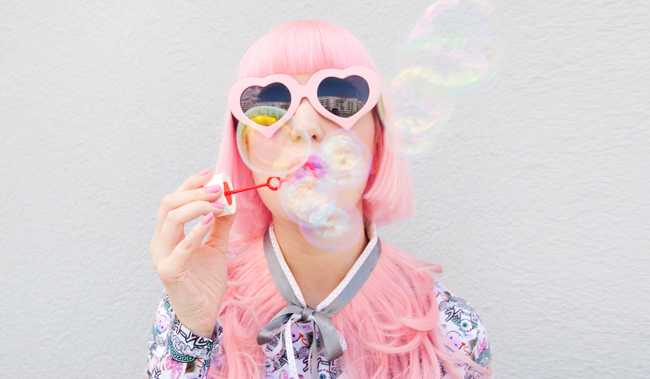 Bubblegum pink is my colour therapy, candy floss my philosophy. A few years ago I tended to dress black or gray, whenever I had a difficult time. Nowadays I think that's completely the wrong thing: Colours (and especially pastel colours) are an astonishing antidote against dark moods. Don't underestimate the power of cuteness! I especially love this outfit, because it contains many things that make me smile. Making soap bubbles during the shooting was just too much fun. I nearly emptied the whole bottle, because I couldn't stop anymore. I didn't do this for ages and was fascinated by how wonderful the bubbles look in the light. Isn't it amazing how beautiful something as simple as soap bubbles can be? 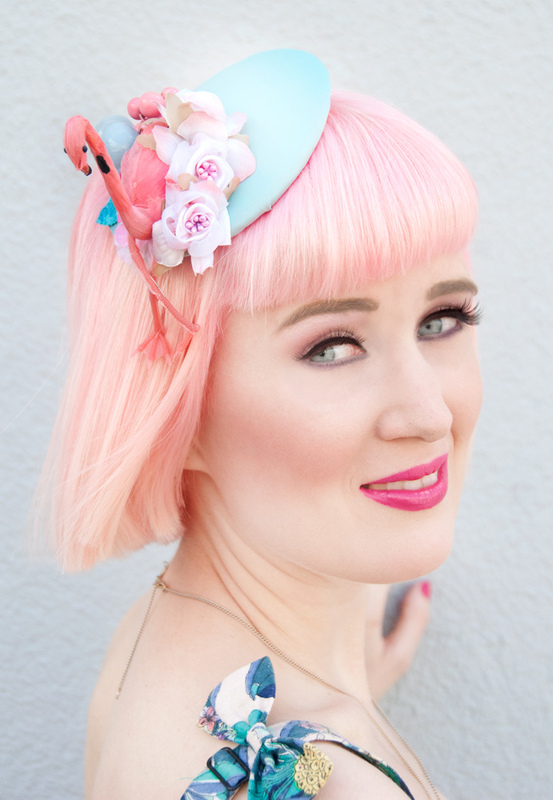 Today's look includes the fulfillment of a dream: A while ago, I spotted this pink hair collar on a page. I didn't know who designed it or where to get it, but it was love at first sight and never left my mind. A few months later I was introduced to a lovely French girl called Clara Chérie and was so surprised to see it on her page again, among a lot of wonderful creations. I begged her that I needed to wear this, and here it is on my neck. 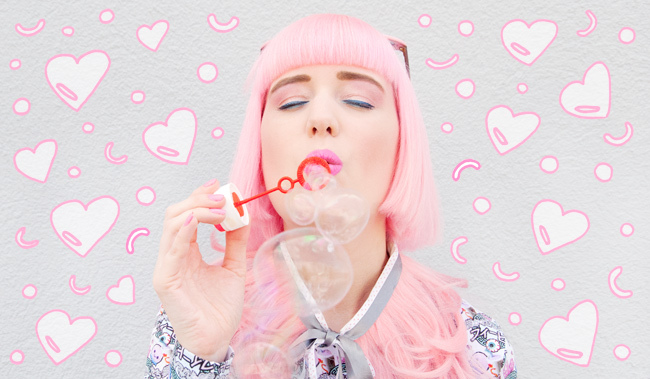 Dreams don't burst like soap bubbles all the time, but sometimes they come true in Barbie land! 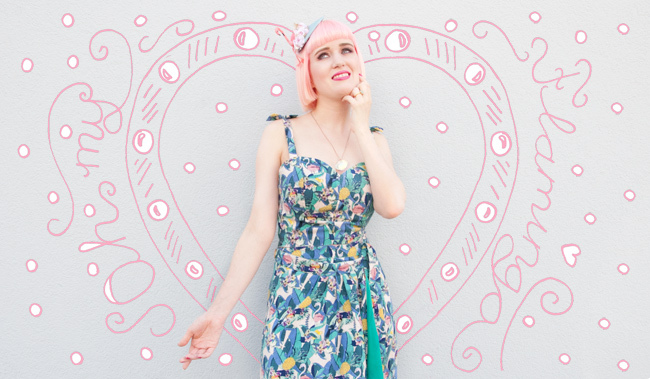 What are your fashion dreams come true my lovelies?